JERUSALEM, Israel -- After being disinvited from a scheduled official visit to Israel last December to celebrate the 25th anniversary of the establishment of Ukraine-Israel diplomatic relations, Volodymyr Groysman, the Prime Minister of Ukraine has arrived in Israel with a delegation of ministers for meetings with Prime Minister Benjamin Netanyahu to finalize cooperation deals with regard to counter-terrorism, health, and statistical data exchanges. 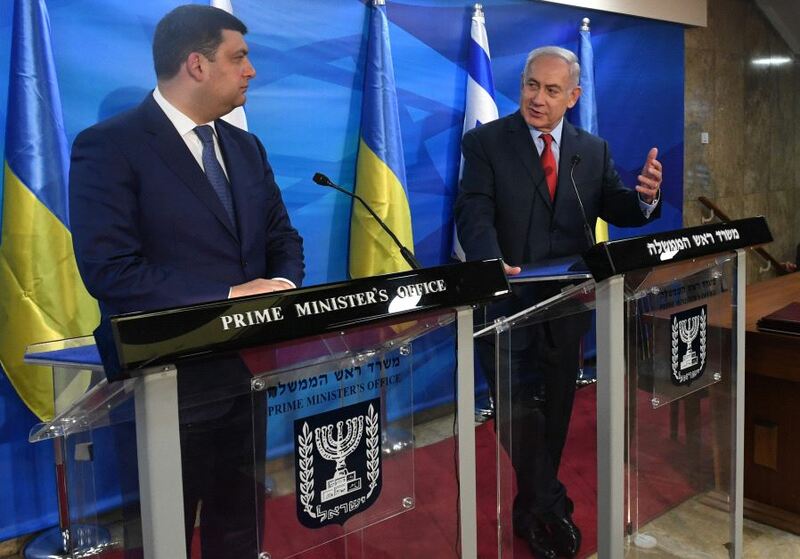 Netanyahu and Ukranian PM Volodymyr Groysman (L). Groysman met on Monday with President Reuven Rivlin and was scheduled to see Knesset Speaker Yuli Edelstein Agriculture Minister Uri Ariel, members of the business community and the heads of Teva Pharmaceuticals, as well. Groysman was disinvited to Israel in December, in protest against Kiev’s vote at the United Nations Security Council in favor of an anti-settlement resolution. In response, Israel’s ambassador to Ukraine Eli Belotsercovsky had been summoned by Ukraine’s Foreign Ministry which expressed its extreme displeasure at the snub to its head of government. He had been elected only months previously. Rivlin greeted him with effusive warmth, saying that it was an honor and a pleasure to welcome him to Jerusalem, the capital of Israel. Groysman arrived at the meeting with Rivlin after a visit to Yad Vashem, and made no secret of the emotional impression that the site had made on him, particularly at the Children’s Memorial when reading the list of names of 1.5 million children who had been murdered by the Nazis. The Holocaust, its atrocities, and its lessons, took up a significant part of the conversation between Rivlin and Groysman. Rivlin was in Ukraine last year to deliver a memorial address at Babi Yar, the ravine where mass massacres were carried out by the Nazis. He had cut short his visit to Kiev due to the death of former President Shimon Peres, but had continued his conversation with Ukraine’s President Petro Poroshenko, when the latter came to Israel for the funeral. Rivlin said that he was pleased to see how committed Groysman and Poroshenko were to fighting antisemitism. Alluding to Ukrainian collusion with the Nazis during World War II, Rivlin said that although Israel and Ukraine enjoy very friendly relations today, in order to promote better understanding between the peoples of the two countries, it was important to acknowledge the past. Groysman confronted the past at Yad Vashem, but at the same time reported that 2,500 of his fellow countrymen had been recognized as Righteous Among the Nations. Both Groysman and Rivlin referred to the fact that Nazis and fascists made no ethnic distinctions in their murderous onslaught, but also killed Roma and large numbers of other Ukrainians. Rivlin, for his part, insisted that no other tragedy could compare with the tragedy which had befallen the Jewish people. Groysman also spoke of the much more recent and even current suffering inflicted on the Ukrainians by the Russians. Rivlin disclosed that this had come up in discussions that he had with President Vladimir Putin during his visit to Moscow in March, 2016. He further spoke of Israel's concerns regarding Russia's military presence in neighboring Syria's civil war.